A trip through India can be an extremely diverse adventure, as I discover on a train journey from Mumbai to Delhi. We started off our 9-day luxury train trip in the warm city of Mumbai. Chaotic, crowded and colorful are the best ways to describe the place. Mumbai is exploding with sounds and smells, overpowering and overwhelming at times. We had little time in the city as we were scheduled to board the train the following day. The Maharaja’s Express was going to take us through most of Rajasthan and include stops at Ranthambore National Park to hunt for tigers, obviously, not in the literal sense of the word. The Bengal tiger is India’s and Bangladesh’s national animal but it can also be found in Nepal and Bhutan. At 2,500 species, it is considered an endangered species. I was quite excited to see them in the wild but my hopes were completely killed by our park guide: “We have not seen any in a month” he whispered as we left the entrance in a sub-zero temperature open air jeep. I suddenly wondered what I was doing there. It was 6am, we were in an open air jeep in a freezing weather, the wind chill made things even worse and no matter how many layers of clothes or wool blankets I had over my shoulders and legs I could barely feel my feet and face. Sharply came the memory of my warm train bed – could I ask to be dropped back at the train station? The answer would have probably been “No”. I am not one for cold weather. My mum always reminds me of my teenage years when I used to get out of the house in the middle of the winter with a tiny top and a coat and be fine with it. “Sarna con gusto no pica” (roughly translated as willing/voluntary pain/suffering does not hurt) she used to say. Nowadays, I have realized I am about 5 degrees colder than anybody. It could be because I have lived in tropical climate for so long that my body has accustomed to the heat. On the flip side, when most people sweat and suffer from unbearable heat I can usually cope. I like walking and I do so for at least an hour every day in the heat of the day in Singapore and, although I can’t deny the heat eventually gets to me and I can certainly cope better than the rest. Not to mention the poor European friends who visit and simply have to retire to the comfort of the mall during daylight. So sitting there in the open air jeep after hearing the guide tell us that our chances of seeing a tiger were slim to say the least all the suffering from the cold seemed unnecessary. 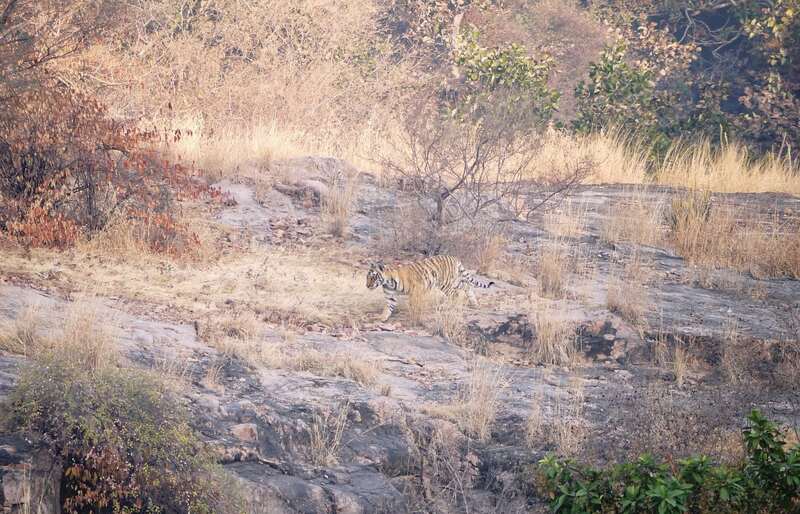 Ranthambhor National Park is mostly known for the tiger and there isn’t much more to see other than that. In the 3-4h we were there we only saw a couple of monkeys and birds although the authorities claim that there are several other species. So after a couple of hours I was frantically counting the time back to the train until, suddenly, as if as payment for the suffering and perseverance, we spotted a wounded mother and two cups not too far away from the car. In a second, I completely forgot about the cold and even ventured my hands out of the blanket to take as many shots as I could. They gave us enough time to observe them and see the two younger ones playing around. 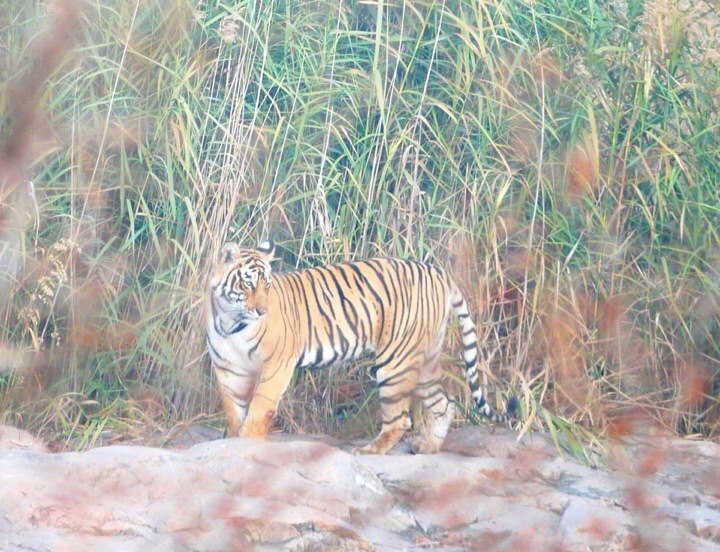 Tigers are a rare sight in the wild. They are shy and tend to hide during the day. 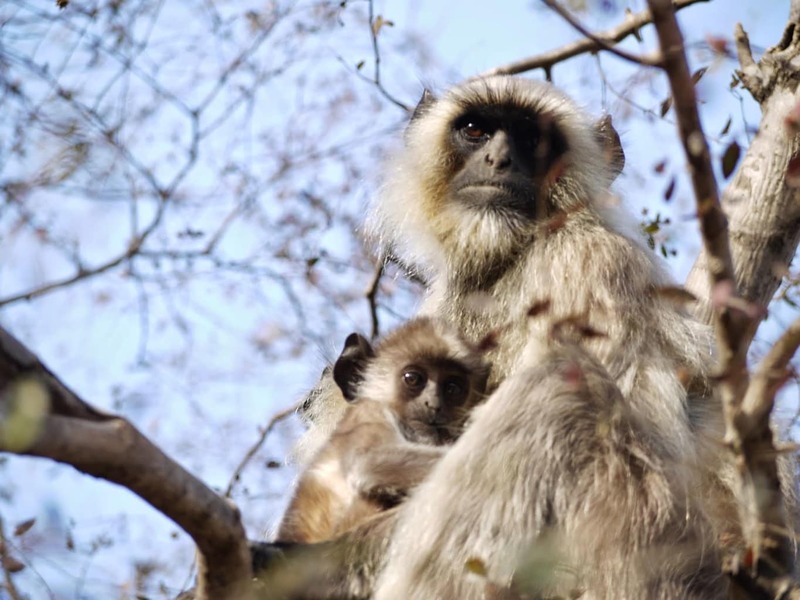 Their numbers are low because of poaching for illegal trade of skin and body parts partially for use in Chinese medicine as a bone strengthener. After spotting them we had got our trophy and there was no more reason to stay in the park so after winding back out we were dropped at a beautiful Hotel for brunch around the camp fire. Hot coffee has never tasted so good.